Home Page | Do the Pocket Profiles require any special care? Do the Pocket Profiles require any special care? The AntiGravityGear Pocket Profiles™ are waterproof, rub resistant and tear resistant. Backpacking subjects gear to the most strenuous of conditions that will test the limits of any well made piece of gear. And so, as with all backpacking gear, there is some special care that can be taken to preserve the life of your Pocket Profile™. Your Pocket Profile™ is rub resistant, meaning the ink is quite durable and will not rub off easily. And while your profile is in no way fragile, abuse can test the limits of the rub resistance. The folds are likely to wear the quickest. Avoid overworking the folds. One strategy is to roll the map and put it in your accessory pocket on your pack rather than folding it. As with any gear, it’s not good to fold your Pocket Profile™ up while wet for storage. After it has gotten good and wet, give it a good dry off before folding and stowing it. 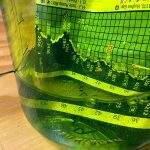 If your Pocket Profile™ was accidentally allowed to dry completely from wet while folded, and is frozen together, run it under water for a while and slowly and gently work it apart. Your Pocket Profile™ is tear resistant, meaning it’s difficult to tear, but not impossible. Keep it away from sharp objects that could puncture it in your pack. A little care and good common sense will go a long way to preserving the life of your Pocket Profile™. 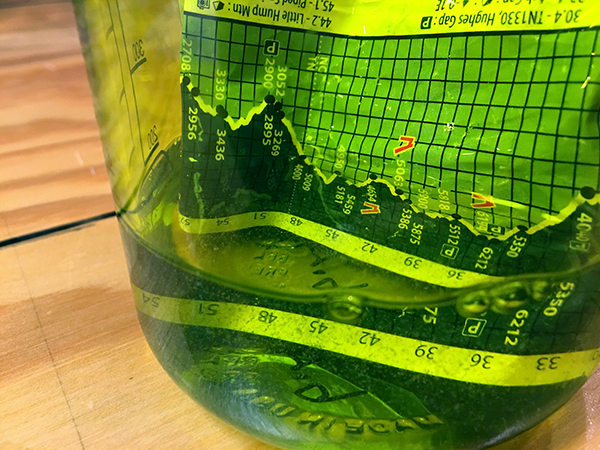 The Pocket Profile™ in the photo to the left has been soaking in this Nalgene bottle for 6 months. It has been taken out and crumpled up and put back in several times. Basically, we’re abusing it. While it definitely does not look as beautiful as it did when it was brand new, it is holding it’s own. It’s still quite readable, and would definitely still get us down the trail.